Organising an exhibition stand for the first time can be quite a daunting project, so we have used our experience as professional exhibitions contractors to bring you our tips on exhibiting. Although our aim was to help first-timers how to draw up a successful plan of action, seasoned exhibitors will probably find it useful too. A pro-active platform – buyers come to you. Face-to-face customer contact – the best way to build relationships. A high volume of qualified prospects – all in one place. The best chance to get your products or services in front of potential customers. And remember… Visitors are serious prospects because they have gone to the effort and expense to be there. Exhibitions can be a highly effective marketing tool if planned and carried out correctly. At Access Displays and Design Shop, we are keen to offer more than just design and build. We help our clients to integrate their exhibition activity into an overall marketing plan to ensure they get the maximum return on their investment. That is what you need to do too. If you are looking for an insight into how the exhibition world works, read on! We will explain the pros and cons of different approaches, show when and where our services can be of help and highlight potential problem areas. This will help you get your trade show or exhibition off to the best possible start. Whether this is your first event or you are a seasoned exhibitor, we hope you will find these tips useful. Most importantly, they can help you improve your return on investment. 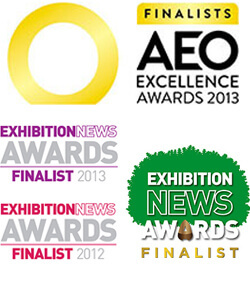 It is easy to underestimate the time you need for planning and preparing for an exhibition. Planning ahead will make everyone’s life much easier. If you put the preparations off until the last minute, it will create stress for you and your contractor. It can also become expensive as some venues put up fees for electrical work etc as the opening day approaches. For this reason, it is a good idea to appoint an exhibition coordinator, as this is someone who can have overall responsibility for the project and the clout to get things done! It is a good idea to list key tasks and allocate responsibility, then set deadlines for completing those tasks. Finally, circulate the plan to individuals and departments responsible for input and chase them! A listing of major exhibitions and their organisers in the UK and around the world can be found in the Exhibition Bulletin, which is a monthly publication available on subscription or public libraries. (Telephone number 0208 846 28000). You can also take a look at our own lists of international exhibition venues and UK venues. Is it a new event? If so, how long has the organiser been established and what are their credentials? Does the show attract market-leading companies? The trade magazines chosen by the organisers in which to advertise the event will be a good indication of the audiences that are being targeted for the show. If these are the right sort of audiences for your products or services, you are likely to have a good fit with the show. If you are having designs and quotes for a custom-made stand, tell the contractor what your budget is. The contractor can then make sure that you get the most for your money and avoid any confusion as to how much you want to spend. Then, if you’re getting several quotes, you’ll be able to compare exactly what each contractor can offer you within your budget. It is important to book a space early as this gives you the best chance of obtaining the ideal site. You then know exactly what space you need to fill and you can plan to make the best use of it. If you decide to hold off until the eleventh hour, you might get a space at a reduced cost, depending on the show. However, there will generally be little choice of size or position and you could end up with no space at all! Because you don’t know what you are getting, it will be harder to plan ahead. You might have to compromise designs and you can’t start promoting the show until you know your booth number. Island and corner sites offer more open sides, therefore there are more opportunities for the visitor to step onto your stand. If you aren’t sure where to start, we can advise you on all of the above. If you want to know who is likely to come along to a particular trade show or exhibition, ask who came last year. The organisers can usually give you a detailed breakdown of previous years’ attendance. Generally, the people who come along this year will be similar to the ones who came last year. This is very helpful when you are deciding what to exhibit and what the best marketing messages will be. Who are you aiming to attract? What’s the “hook”, the message you want to get across to them? What products will visitors be most interested in? What targeted promotions are the organisers planning? Can you get some mileage from them? Health and Safety has become a real issue in exhibition halls, especially with build and breakdown times getting shorter and shorter. When exhibition contractors are working under pressure, you can really see why you need experienced professionals for stand design and build. The British Exhibition Contractors Association (BECA), now ESSA, will provide you with a list of approved contractors that meet the high level of workmanship and business practices ESSA require to award membership. You will also be covered by the associations guarantee bond, underwritten by a major UK insurance company. Full details are shown on our ESSA Certificates. You have read through our tips and you have a good idea of what’s involved in exhibiting. You know you need to be aware of all these points and this will help you exhibit effectively – and with the least stress. When you choose an approved contractor, you know what to expect from them and you now know that this will allow you to concentrate on “your bits”. When you are free from the “nitty gritty”, you can focus on making the most the unique sale opportunities that an exhibition provides. You are secure in the knowledge that there’ll be nothing waiting round the corner because a professional exhibition contractor will have it covered. We know how often there’s something that crops up on the day of the exhibition. That’s why we are available. You can contact us on the day and benefit from years of experience in the industry. You can also ask us to help you “top and tail” your event and help with a host of other arrangements, from transport for delegates to drinks receptions. Just ask! Our teams know all the major venues throughout Europe, best access and parking places and who to talk to on site to make sure things happen. Whatever problem they are faced with on the day, it’s unlikely to be new to them or for them not to have a solution.